Many people prefer a rectangular garden table. It’s a classic shape that tends to suit any type of garden or patio. 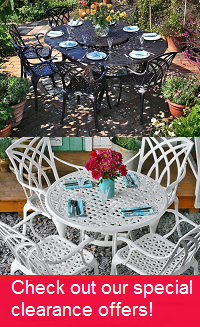 We have a variety of 6 seater garden table sets available, all made of high quality cast aluminium. The vast majority of our outdoor patio furniture is made of this lightweight, sturdy and weather resistant material. Alongside traditional styles of metal garden table, we have some sleek, contemporary 6 seater rectangular garden table sets. Some are extendable tables. If you wish, use the panel on the left hand side of the page to filter by colour or price. One of our most popular 6 seater metal garden tables is the Sophia table. This wonderful table has a lattice table top design and space to fit a parasol. The Sophia is 200cm by 120cm. Following the link above will take to the Sophia table in Antique Bronze, but if you prefer the look of a white metal garden table, the Sophia comes in white too. The Lottie table is a modern style table which extends from 160cm to 210cm in length. It comes in grey, black, White and Champagne, and White and Grey. Another modern, extendable garden table is the Daisy table. When extended, this table reaches 200cm in length by 90cm. These modern style garden tables are just as weatherproof as our more classic styles, and look just as smart in the dining room as they do on a patio. Once you’ve chosen the right 6 seater rectangular garden furniture for your garden, choose which chairs to pair with the garden table. A default chair will be available at no extra cost, but take a moment to consider the other garden chairs, such as the Rose, Emma or Kate chairs. You can pair one of these other styles of chair with your 6 seater table for between £5 and £25 per chair. These garden chairs are made of the same weatherproof and robust cast aluminium as the tables. For our modern style 6 seater cast aluminium garden furniture, the chairs have an aluminium frame with the seat and backrest made from a hard-wearing outdoor mesh fabric. We offer free delivery on all of our metal garden furniture, so when you get to the checkout page there won’t be any extra charges. You can enter delivery preferences on the checkout page too, in the “comments” box. We’ll pass these on to the courier. Certain orders can even be tracked in real time on our courier’s website. Upon request, they can also keep you up to date regarding the delivery status via text message notifications. Our delivery information page has more details. Your 6 seater garden table and chairs will be more enjoyable when enhanced with a few accessories such as seat cushions and a parasol. Underneath the section where you choose your chairs, you’ll find offers for seat cushions in various colours and parasols. Purchasing these accessories along with your garden furniture set allows you to save 70% on them, compared to buying them separately, so don’t miss out on this opportunity! We’ve got other offers too. You can get between 20% and 80% off various aluminium patio furniture items such as side tables, bistro sets or sun loungers. But these offers will be unique to this page, so combine them with your main order to take advantage. In general, we have some outstanding deals on our clearance page, too. These standalone deals apply to all kinds of outdoor furniture, from side tables to 12 seaters. They change all the time, so check back regularly, and if you see bargain on something you like, take advantage while you can! The friendly Lazy Susan team is always happy to help, whether you want to learn more about a particular aluminium garden table and chairs, or you’d like details about the delivery procedure. You are welcome to give us a call on 01243 717197, or send us an email at [email protected]. We try to answer all emails within 2 hours during office hours, daily from 08:00 to 18:00.